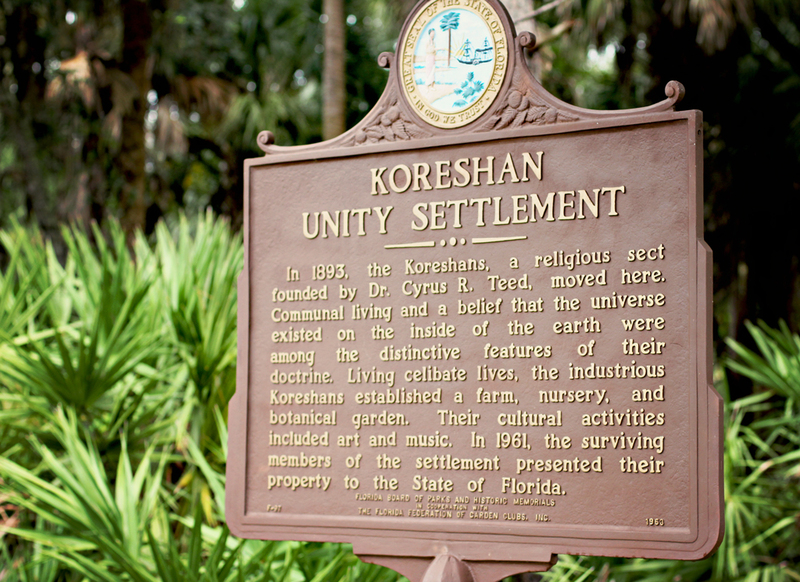 We have lived in Florida for 10 years, before we took the time to go visit the Koreshan Unity Settlement! We explored the structures and gardens of the 19th century religious settlement. It gives you an opportunity to learn about these idealistic pioneers. I loved how this was a self-guided walk through the grounds, so we could spend the most time, at the buildings or the gardens that really caught our eye. You are viewing the Art Hall…love the wrap around porch. 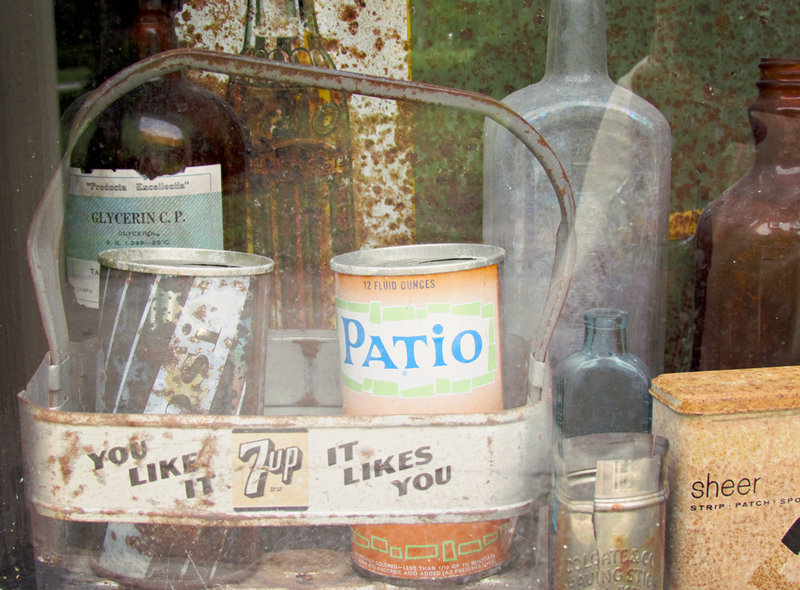 The old general store windows…don’t you wish products could still be packaged like this? Another window of vintage products from the store. These are the original stairs that lead from the Estero River to the Old General Store. The surrounding community could guide their boats and canoes from this staircase, up to the store to purchase their needs. 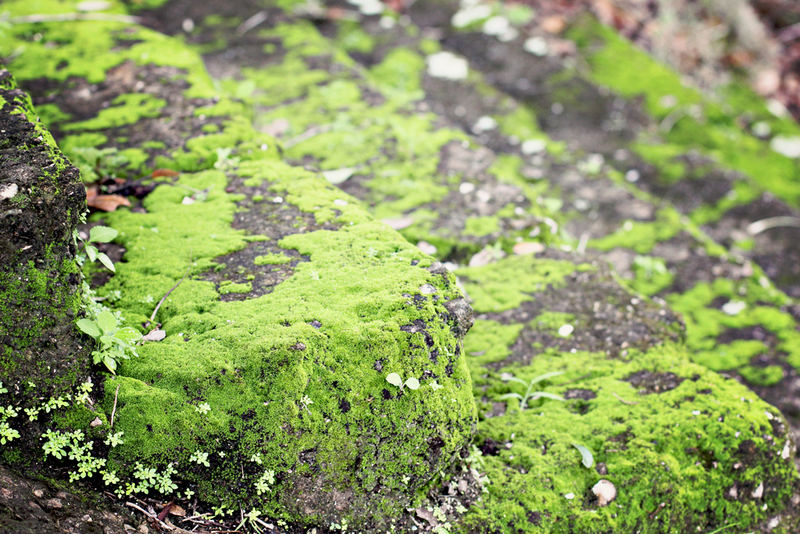 Call me old fashion…but this girl just loves all this green moss on the stairs. It gives the surface a dash of rustic beauty and a splash of color. These small plants have a velvety texture that softens the look. Sometime Mother Nature does not place nice with the outside elements, but in this case she beautified it. A common mistake with beginning photographers is to try and show too much. This leads to cluttered, boring images that do little to engage the viewer’s brain. In order to create a powerful photo, you need a main subject. However, you don’t have to show the whole thing. See the image above, with the partial view of the stairs. Abbreviating your subjects can be a very powerful method towards creating a compelling shot. Especially if they’re things that we’re all familiar with. If you only show part of a subject, you automatically activate your viewer’s imagination as they try to picture the rest in their mind. Photography is a two way street: You have creator and viewer, and if you bring your audience into the process, you invite them to become more connected to your shot. Remember, good photography isn’t about perfectly reproducing your subject, it’s about creating a visual representation that communicates the ideas or emotions that you had about the scene right when you pressed the shutter. You can view the rest of the brilliant post by Dan Bailey: More Powerful Images at Digital Photography School. I have only touched the tip of the iceberg with this community. Can I tell you, it was just mind blowing? Stay tuned…next week I will bring more of the grounds and other unique buildings. I really appreciate your photography tips! Very helpful. Fantastic shots Laurie! What part of FL is the Koreshan Settlement in? I’m with you, I also love the moss. Laurie, I am so in agreement about the beauty of moss. We have it on some of our rocks, trees, and between bricks of my garden path. It is such a lovely shade of green. The porch you’ve featured is charming. 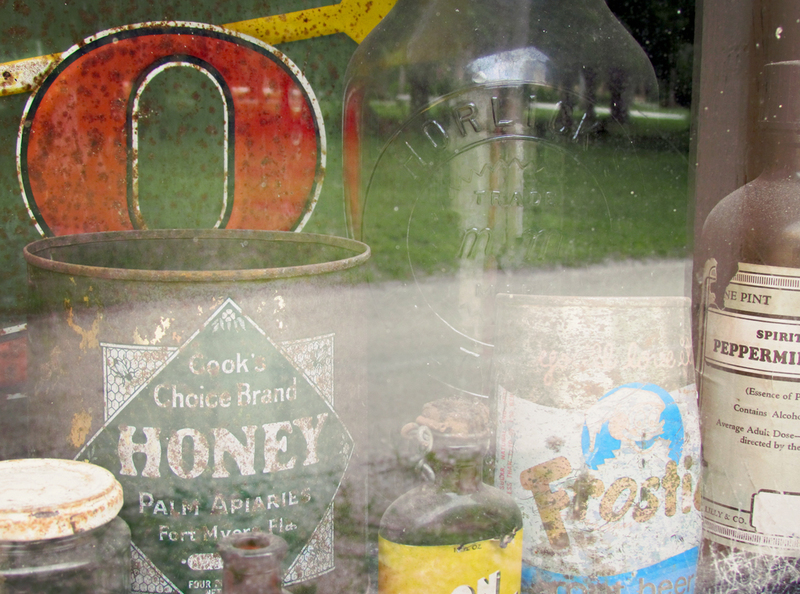 My grandmother owned a general store and kept the old interesting packages for many years…what great photo opps! You really brought that back to me with this post. I love that it’s part of the state park system. Your photos are great and I can almost imagine sitting on the porch in that rocker. WOW!!! your post is interesting!!! Mind looking my blog or follow?? Thanks for the tips – I really enjoy them. I am trying to take more interesting pictures – some of them are really good IMO. But I need a lot more work on framing and making them interesting. I love your pictures. I am on my iPad and when scrolling through your pictures it gave the illusion of the rocking chair moving – it was pretty neat! wonderful images! 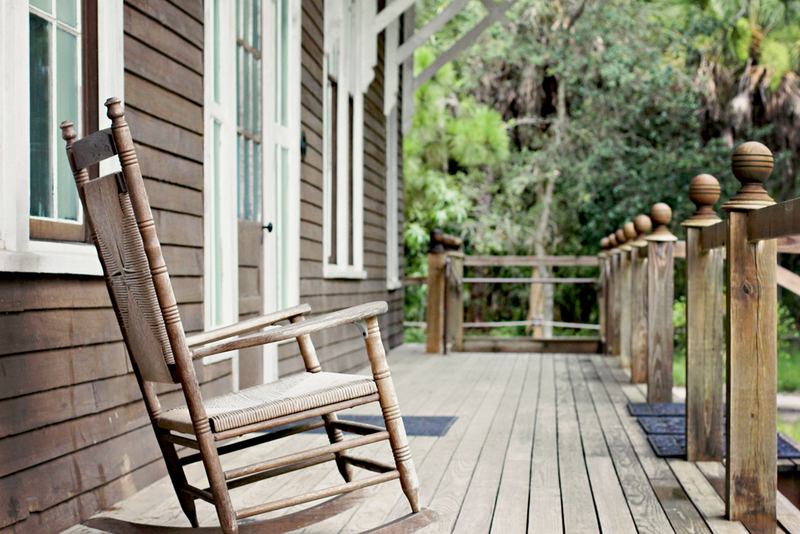 love the depth of field in the porch photo. and I agree w ur advice- leaving some of ur subject out leaves room for interpretation-true art. thanks for sharing at1440 ! I have never visited this place and I live just a hop skip and a jump away – in Naples! Never heard of this community– I especially enjoyed the remnants of its existence. This looks like an interesting place to visit. It really seems to give you a feel for the way they used to live. Thank you for an interesting post and the link to Dan Bailey’s photo lesson. Great tips all!!! Well we all have our loves…if the big camera is not doing it for you…by all means don’t use it. With your back acting up at this time…probably is best anyways.You don’t need to be tightening up those back muscles carrying it around. Love that last shot! That green is mesmerizing. Not sure about the philosophy of living celibate lives…I guess they spent a lot of time on that wrap around porch! Lovely photos. What an interesting place, nice photo’s too Laurie. I wonder how they continued there for so many years living a celibate life? I love the wrap around porch. And I also enjoy the old grocery items. Thanks for the tip too! Great tips Laurie! And love your photographs of this historical place – perfectly captured. Gosh these are just wonderful! So full of life and color. I do miss photos of “little man” though. He is such a cutie. AND THANKS FOR THE WONDERFUL TIPS! They are always so helpful to us wanna be’s. Have a great weekend. Appreciate the tip. I do love when I see photos that show a partial of the subject, and I need to remember to practice that. 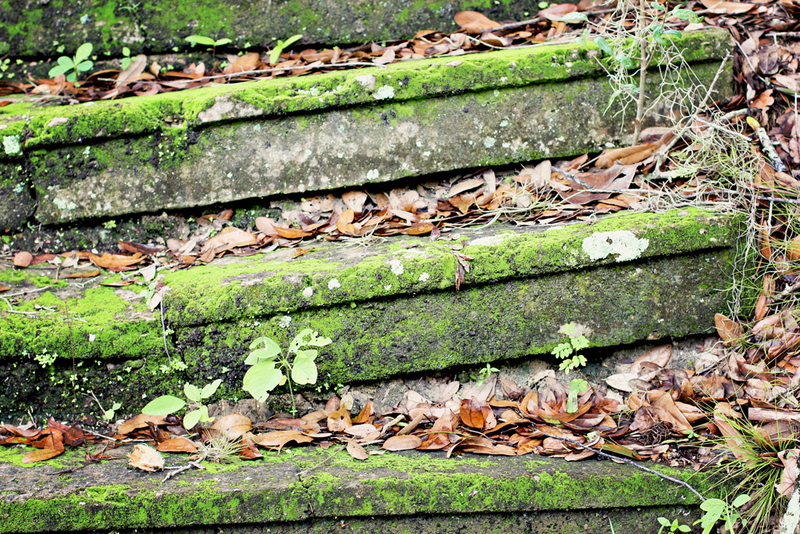 Also, love your idea of the moss on the steps beautifying it and it does make it look rustic and yonderyears. Enjoyed my visit through your lens. 🙂 Happy Friday and have a great week-end. Great tips. Simple is always better in my opinion. I am really looking forward to seeing more of your photos of this settlement. I am curious. Are there similarities with the Shaker communities? I love how you always go exploring, there is often so much to see and learn right where we live! Thanks for the tips, I did go over to the Daniel Bailey post, his photos and tips are awesome and easy to understand, thanks so much Laurie! Your photos are always activating viewer’s imagination. Thanks for the wonderful tips! I love places like this! So amazing to see how things used to be! Beautiful photographs! Excellent tips as well – I will definitely be putting them to use next time I am curating photos for my posts! I just love seeing your photos. These look amazing. Thanks for the tips my friend. Lovely set of this place. I am not sure it is an old fashion to like green moss on the stairs. Perhaps, liking 7Up might be. Regardless, the shorts are great! Really like the porch shot!